When the Nobel Prize for Literature was awarded to Bob Dylan in 2016, a debate raged. Some celebrated, while many others questioned the choice. How could the world's most prestigious book prize be awarded to a famously cantankerous singer-songwriter who wouldn't even deign to attend the medal ceremony? 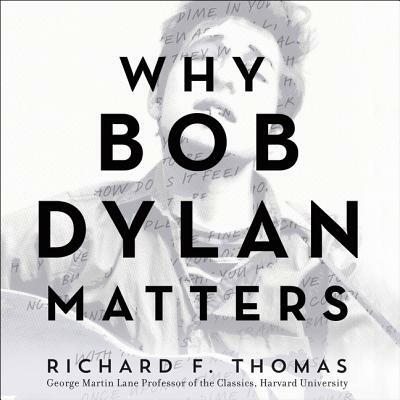 In Why Bob Dylan Matters, Harvard Professor Richard F. Thomas answers this question with magisterial erudition. A world expert on Classical poetry, Thomas was initially ridiculed by his colleagues for teaching a course on Bob Dylan alongside his traditional seminars on Homer, Virgil, and Ovid. Dylan's Nobel Prize brought him vindication, and he immediately found himself thrust into the spotlight as a leading academic voice in all matters Dylanological. Today, through his wildly popular Dylan seminar--affectionately dubbed Dylan 101--Thomas is introducing a new generation of fans and scholars to the revered bard's work. This witty, personal volume is a distillation of Thomas's famous course, and makes a compelling case for moving Dylan out of the Rock & Roll Hall of Fame and into the pantheon of Classical poets. Asking us to reflect on the question, What makes a classic?, Thomas offers an eloquent argument for Dylan's modern relevance, while interpreting and decoding Dylan's lyrics for listeners. The most original and compelling volume on Dylan in decades, Why Bob Dylan Matters will illuminate Dylan's work for the Dylan neophyte and the seasoned fanatic alike. You'll never think about Bob Dylan in the same way again.